Mia Frogner closed out her third set victory Sunday with a backhand at the net, sealing the second straight Ohio Valley Conference Tournament title for SIUE women's tennis. 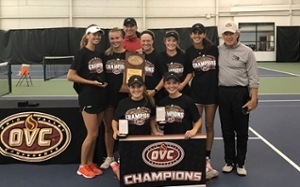 SIUE defeated Eastern Kentucky 4-1 in the OVC Championship match. The Cougars completed the regular season and the league tournament with a perfect 21-0 dual match record. Next up for the Cougars will be the NCAA Division I Women's Tennis Tournament. SIUE will discover its first-round NCAA opponent May 2 in a live selection show on NCAA.com. SIUE took control of the match early by winning the doubles point. Frogner and Tiffany Hollebeck downed Vikroija Demcenkova and Kristina Lagoda at No. 1 doubles. Lexi Aranda and Morgan Steffes then captured the doubles point with a 6-2 win over Laura Arg Escamilla and Raquel Montal Perez at No. 2 doubles. Escamilla provided EKU’s only point before the match concluded, defeating Hollebeck 6-0, 6-0 at No. 3 singles. The Cougars regained the lead quickly on a 6-2, 6-1 win by Steffes at No. 3 singles over Sagung Putri Dwinta. Aranda made it 3-1 with a 7-6 (7-2), 6-1 triumph over Lagoda at No. 1 singles. That set up Frogner to clinch the match. Frogner needed three sets at No. 2 singles to defeat Demcenkova 6-0, 6-7 (2-7), 6-2.